Designed by Pre-Raphaelite artist Marianne Stokes (1855-1927), “Ehret die Frauen” means Honor the Women. 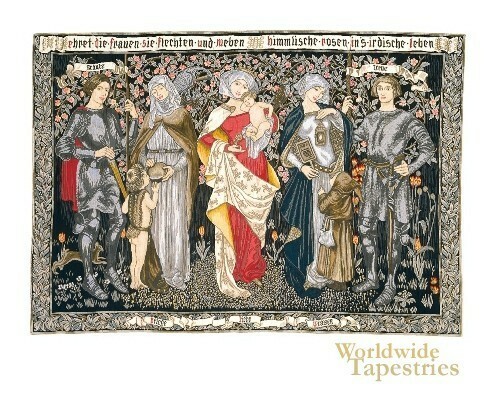 Stokes used Friedrich von Schiller’s poem Wurde der frauen as the inspiration of this work, which was first woven by Morris & Co in 1912. “Ehert die Frauen” shows a group of five figures: Courage, Caring, Love, Wisdom and Fidelity. The inscription means, “Honor the women, thy wife and weave heavenly roses into earthly life”. It is a fine example, not only of Stokes’ artistry and fine use of vivid colors, but the high quality weaving that makes such a piece highly collectible. “Ehret die Frauen” is lined on the back and comes with a tunnel for easy hanging. The original can be seen at the Whitworth Art Gallery in Manchester England. Dimensions: W 41" x H 26"